Below is the last section of the chapter, in which I visited Gaza for the first time just as the settlers were evacuated. 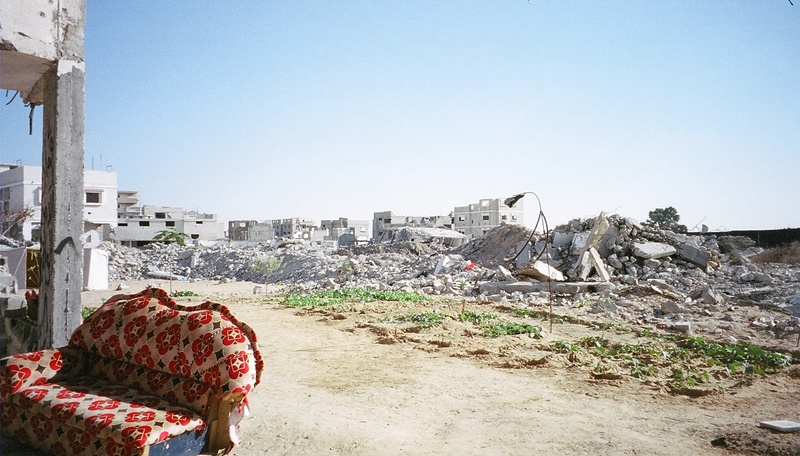 Even after a year in the West Bank, it was difficult for me to imagine life in the Gaza Strip. It seemed less an actual place than a metaphor for human suffering, the modern world’s dirty little secret, a forbidden, forgotten, crowded, impoverished, dangerous, besieged penal colony. Over a million people squeezed into a 27-by-5-mile strip of land choked by settlements, ‘security zones,’ sniper towers, and military bases, like a super-concentrated version of the West Bank. An Israeli officer had recently admitted the army’s raids into Gaza were characterized by chaos and the indiscriminate use of force. “Gaza was considered a playground for sharpshooters,” he explained. 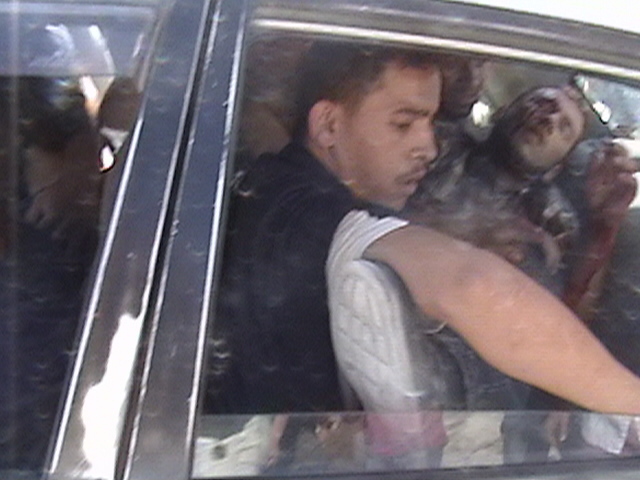 I remembered many of the names and faces of the hundreds of Gazans I had reported on who’d been gunned down. Schools and homes, roads and restaurants—nowhere was safe. The Gazans’ framework had become so warped, most truly couldn’t fathom why Israelis were so scared of Qassam rockets. They could only dream of their only torment being an occasional barrage of unguided missiles with a half-percent kill rate. I arrived at the Erez crossing on Thursday, September 8, not entirely sure whether I hoped I’d be allowed in or turned back. I walked nervously toward a huge parking lot. It had been teeming with trucks and commerce before the near-hermetic sealing of this crossing, but it was deserted now. Two guards called to me and asked to see my passport. I gave it to them. They nodded at each other and directed me to a building further on. Inside the building, a friendly Israeli guard took my passport and luggage. I waited in a small room with other aid workers and journalists, many of whom had probably been forced to misrepresent themselves in order to have any hope of access. I certainly hadn’t mentioned anything about my job in my application. We all avoided eye contact, fearful that anything we said might be used against us. 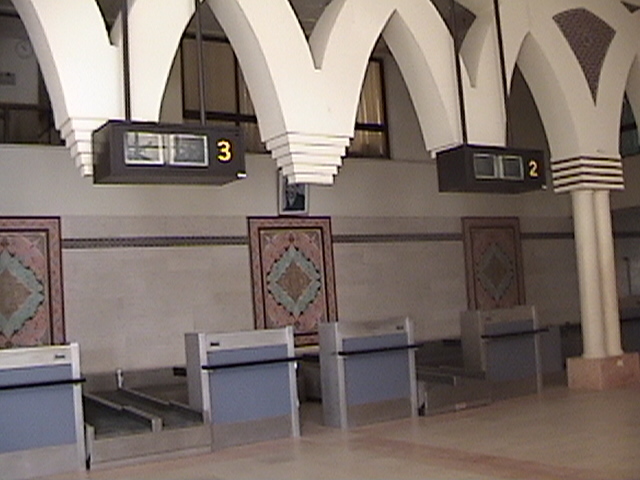 Half an hour later I was called up, given my passport back, and directed to the entrance to the Gaza Strip. I gathered my bags and made my way to the rather intimidating portal, a shabby affair of chipped concrete and metal bars. It led to a passage between concrete walls, a dark tunnel-like path that stretched on for nearly a mile. My feeling of fear and desolation intensified the further I walked down that Kafkaesque lane into God knew what. Presently I came upon a closed metal gate. An unseen Israeli soldier was making blowing noises over a microphone. The blowing noises stopped as I approached. I tried the gate. It was shut tight. I looked around the empty hall. Finally I gave up and sat on a concrete block and started playing with my cell phone to pass the time. Twenty minutes later several Palestinian workers approached from behind me. “Salaam alaykum,” I greeted one of them, and he returned the greeting. “I’ve been waiting here twenty minutes,” I complained in Arabic. He was unimpressed. “Sometimes we wait half an hour, one hour.” He shrugged. Five minutes later the gate creaked opened. A soldier barked unintelligible orders over the loudspeaker. I grabbed my bags, and we all made our way through. At last I neared the end of the tunnel. Two Palestinian women in hijab greeted me with shy smiles and warm Arabic pleasantries. As they carefully recorded my passport information in a tattered green volume, my fear began to ease. A familiar feeling of calm and safety settled over me. It was unmistakable: I was back in Palestine. 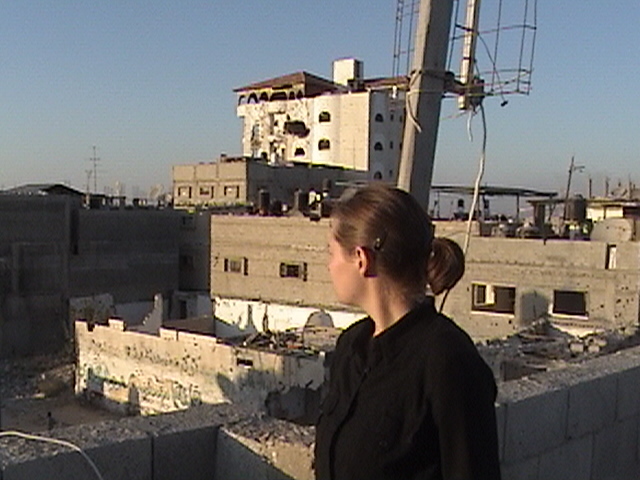 When I emerged, I got my first view of the Gaza Strip. It looked deceptively normal. Agricultural fields spread toward two villages on lows hills. The towns, Beit Hanoun and Beit Lahiya, had once been famous for their oranges, but the Israeli army had razed most of their groves. 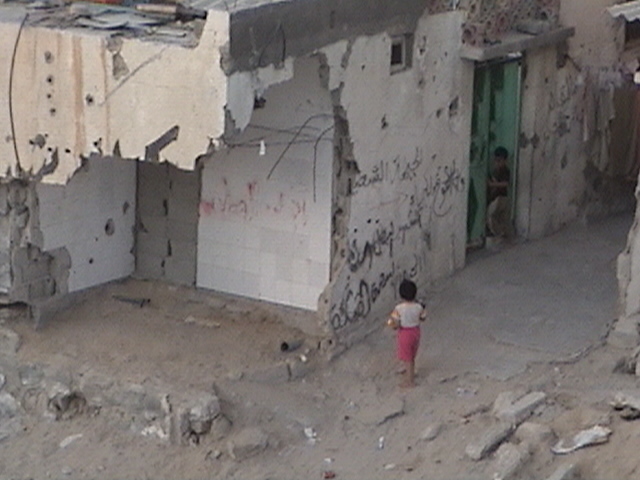 Beit Lahiya was where seven kids had been killed by Israeli tank fire in a strawberry field in January. I made my way to a hotel on the beach, the Grand Palace, one of many swank venues built after Arafat returned in 1994. It was airy and elegant with white arches, and its verandas had fantastic sea views. With its air conditioning, satellite TV, hot showers and soft beds, it was easy to forget I was in a conflict zone on the verge of historic upheaval. Gaza’s economy had been valued at $1 billion before the second Intifada, and the service sector was its largest segment. This hotel was a symbol of what could have been—an entire service industry, an international vacation destination, lost. I went for a walk on the beach the next morning and said hello to a family sitting in a circle of lawn chairs enjoying coffee and cakes. They invited me to join them. A plump, friendly woman fished a pan of crumb cake out of her beach bag and insisted I sample it. I happily obliged, and we chatted and laughed for nearly an hour. When I got up to leave, they expressed the usual mock-outrage that a guest should think of doing anything other than sitting with them and accepting their hospitality until the end of time. 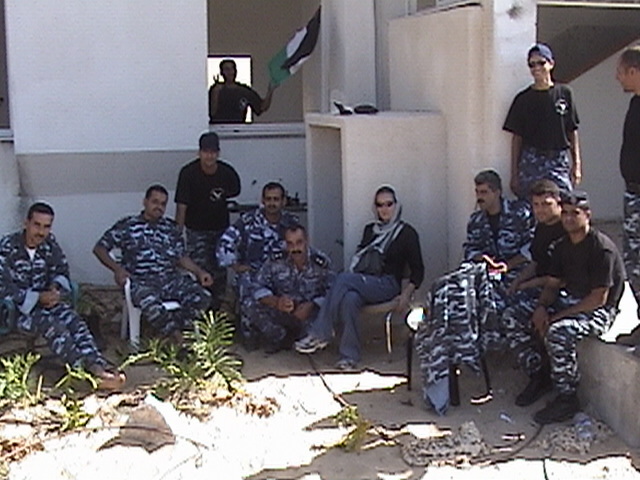 I thanked them over and over, and they made me promise to find them if I ever came back to the beach, or to Gaza, again. Gaza’s seaport came into view as I continued walking, a small harbor surrounded by a stone breakwater. Ramshackle fishing vessels bobbed on the wavelets. It was another deceptively idyllic scene. Gaza fishermen were routinely fired on by the Israeli navy if they ventured past the limit of 12 nautical miles imposed in 2002—far less than the 20-mile limit agreed to under the Oslo Accords. [The limit is now down to 3 nautical miles.] Old photographs showed Gaza’s fish markets overflowing with red mullet, bream, flounder, tuna, sea bass, sardines, squids, shrimps, and crabs. The market today was a sad, scrawny shadow of those days. 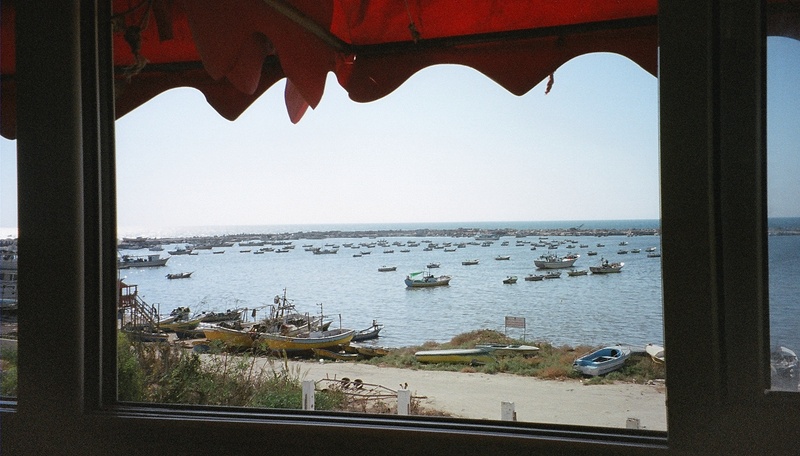 Everyone hoped Israel would remove the restrictions after the Disengagement, which forced Gaza’s fishermen to over-fish young populations near shore, and allow the construction of a deep water port to serve larger fishing and cargo vessels. My primary concern on this aimless day was whether and when the Abu Holi checkpoint would open. 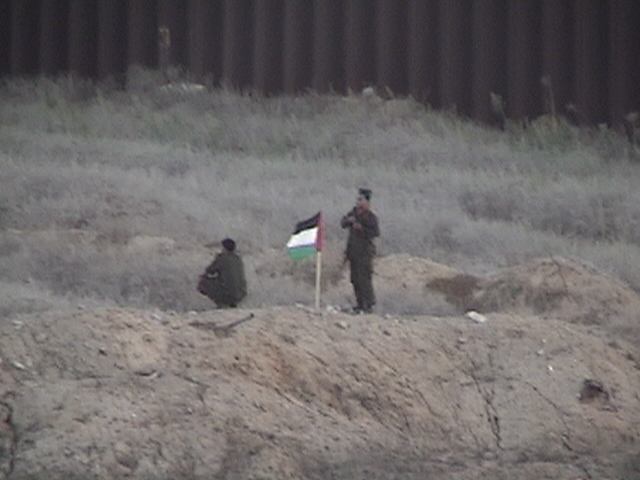 It was the main barrier between the northern and southern Gaza Strip. I’d have to cross it to get to Rafah, Gaza’s southernmost city, by most accounts one of the friendliest and most brutalized towns in the Palestinian territories. I had a contact named Nader, a friend of an American Jewish journalist friend, waiting to meet me there. 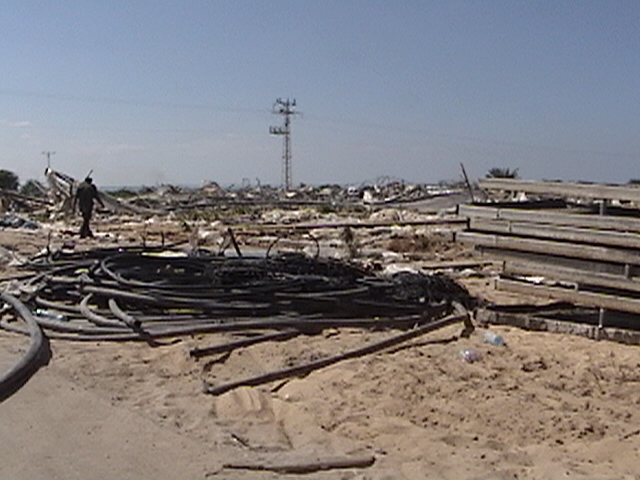 Located on the Egyptian border, Rafah had seen the worst of the violence, home demolitions, and restrictions. Even though the city was only two miles from the Mediterranean, security for settlements dictated that the residents of Rafah were forbidden from accessing the beach. When the last soldiers left in a couple of days, Rafah’s residents would flood into the settlements and run to the long-lost sea. If the checkpoint stayed closed, I would miss this extraordinary moment. Abu Holi had been closed almost continuously for the past several days, open only at midnight on weekdays and all day Fridays. But on this Friday it was shut tight. No reason was given, no timetable made public for when it might open. Everyone was left to hope and wonder. Rumors were flying, and the most widespread and persistent was that it would open at 11:00pm. As eleven o’clock approached, I found a service taxi that was heading south. I and a few other hopefuls crowded in and took off. 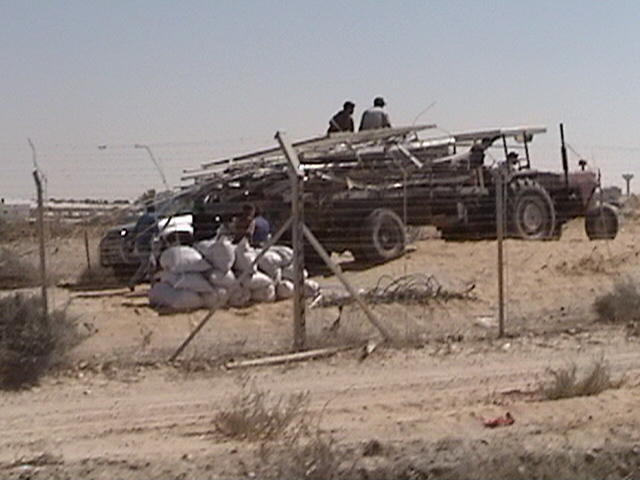 The landscape around the Abu Holi checkpoint was monitored by a monolithic sniper tower. Acres around it had been bulldozed bereft of homes and trees and fields. 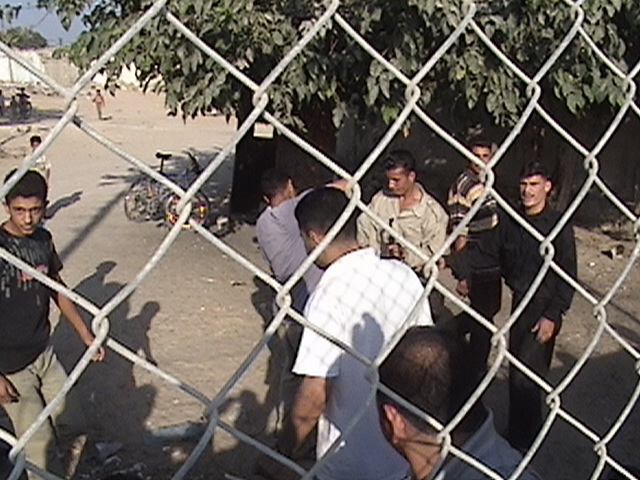 The checkpoint was a prime target for suicide bombers, which meant security was on a hair trigger. A bad read of a soldier’s hand could mean a quick and pointless death. I held my breath as our service taxi inched toward it. We made it through in a little over an hour. 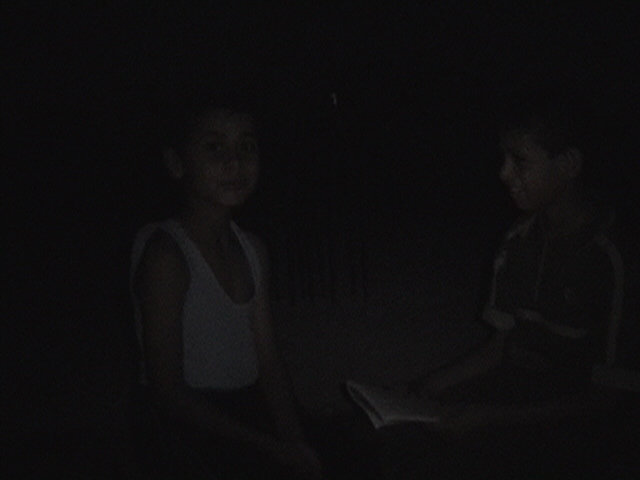 Nader met my taxi in Rafah and introduced himself briefly as we walked toward his house. He was a lanky young man with a crooked nose and a wary, almost manic friendliness. Before I had a chance to respond, we turned a corner and came face to face with half a dozen masked gunmen, probably from Hamas. All of us froze like deer in headlights. Nader said something in Arabic that sounded sarcastic. The militants looked at each other. If it was possible for a gang of masked men sporting assault rifles to look sheepish, they did. We continued on to his house without another word. He insisted I have some tea before we turn in, then he offered me a foam mattress on the floor to sleep on. I fell asleep gratefully, exhausted but euphoric. Somehow I had made it to the least accessible of the least accessible places in Palestine in one of its most historic times. Nader’s mother fixed us a breakfast of falafel, hummus, yogurt, and fried potatoes, then Nader and I ventured outside and I got my first heart-stopping glimpse of the destroyed neighborhoods of southern Rafah. The area is famous for the huge number of homes obliterated in the hundred-meter-wide ‘buffer zone’ along the border with Egypt in order to deter smuggling tunnels. The former swath of neighborhoods is now a rocky, uneven field covered in scrub brush. More than 4,500 Palestinian homes had been demolished in the Gaza Strip since September 2000, most of them in Rafah, and 22,000 homes had been partially destroyed or damaged. 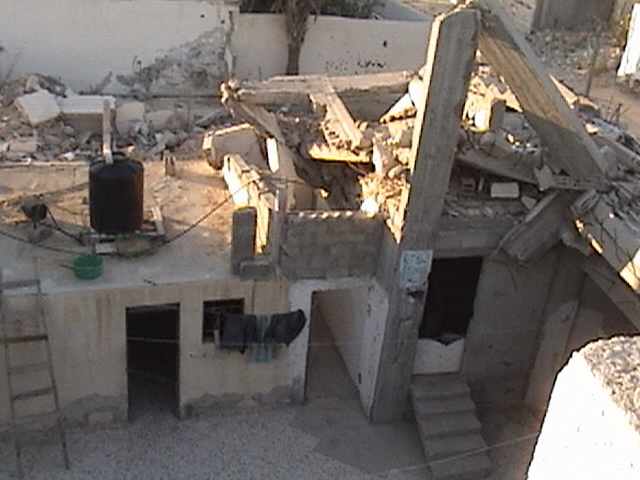 Nader’s house was in the last row of homes that hadn’t yet been totally destroyed, though one of the back walls of his house had been blown out by tank shells. The roof of the house to our left was caved in, but a black water tank, a salvaged satellite dish, and clothes lines hung with laundry indicated that someone lived there anyway. A house further to our left leaned at a forty-five-degree angle, and kids were climbing on it like it was a colossal jungle gym. Every exposed wall was riddled with bullet holes. Across the street a man and his two young kids were starting a fire with dry brush, perhaps to cook or make tea. Their house had one wall busted out so that you could see into the bathroom. When I held my camera up to ask if I could take their picture, the father smiled as if he was standing in front of a proud home instead of squatting over a makeshift fire in a dusty street next to wreckage. 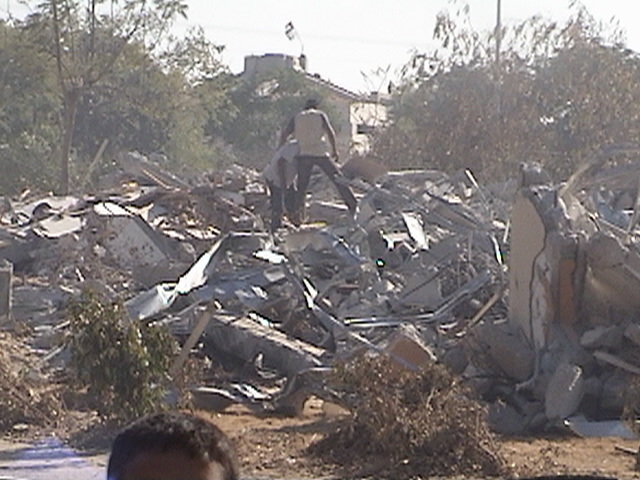 He directed me to some quarters of Rafah that had been bulldozed in the course of a recent military incursion. If the ethnically cleansed neighborhoods of Hebron looked post-Apocalyptic, this looked like ground zero of the Apocalypse itself. A few wire-reinforced concrete support beams stood crookedly, but everything else had been pulverized into thick, grey, ashy dust. My brain clicked off, as if some outer layer of judgment had been blown away in self-defense. All that was left was a childlike observation and acceptance of what I was seeing with no pass through the limbic system to attach emotions to it. I found a child’s marble and a small blue bathroom tile half-buried in the dust. I pocketed them as mementos of this scene and the feeling of horrible numbness it evoked. 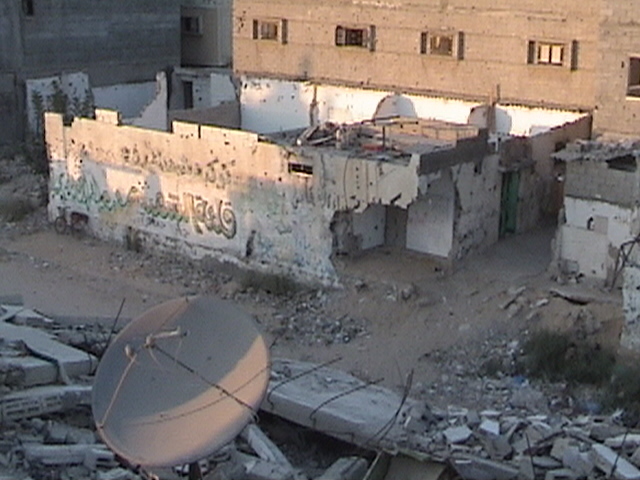 When we emerged from this netherworld, we walked to the Rachel Corrie Center, which hosted art classes, after school programs, an internet café, and summer camps for local youths. The community center was named in honor of a 23-year-old American college student who was crushed to death by an Israeli bulldozer on March 16, 2003 while trying to prevent the demolition of the home of a Palestinian pharmacist in Rafah. The Israeli army claimed there was a smuggling tunnel inside the home. 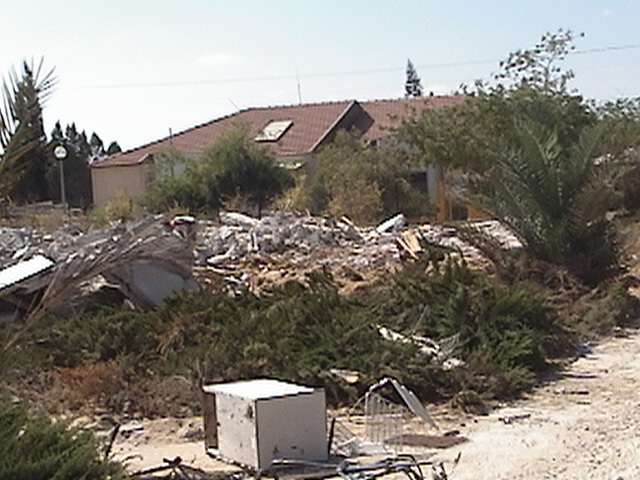 A few months after they crushed Rachel, they destroyed the house. No evidence of tunnels was found. After walking through the center and checking our emails, Nader seemed at a loss for what to do next. “Why don’t we check out the zoo?” I suggested. I’d heard there was a zoo in Gaza, but I didn’t think I would fully believe it until I saw it for myself. When we got there, he insisted on paying my three-shekel (seventy-cent) zoo entry fee, and we walked into a courtyard surrounded by cages. A boy about eight years old was riding around on a Shetland pony trailed by two friends. Among the exhibits was a twelve-foot boa constrictor, dozens of colorful birds, rabbits, puppies, house cats, and a young mountain lion, which the owner proudly said came all the way from America. A monkey lived alone in a cage in the center of the courtyard. He’d taken to an endless routine of jumping up on one wall, jumping back to the ground, spinning around twice, then climbing to the ceiling and screaming. Nader and I watched him in silence. The parallel was almost too obvious, but Nader said it anyway. “At least the monkey doesn’t have to worry about invasions or home demolitions,” I started to say, but I stopped myself. This monkey may have been here when Israeli bulldozers demolished his previous home. He certainly heard the F-16s and Apache helicopters screaming overhead, the gunfire, the explosions, the tanks rumbling by, and the omnipresent unmanned Israeli drones with their psyche-destroying buzz, like mosquitoes the size of elephants. Maybe these terrifying events as much as the cage itself had driven the monkey mad. 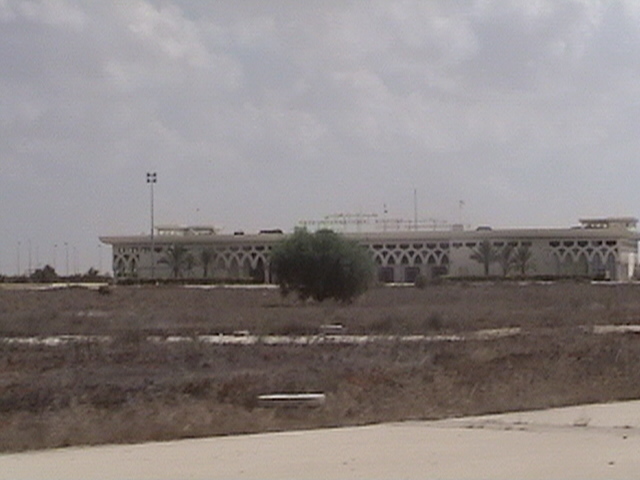 Gaza’s international airport had opened with much fanfare in 1998 only to be shut down three years later when the second Intifada started and the Israeli army bombed the control tower and destroyed the runways. Only the passenger terminal was left standing. It was an elegant edifice with modern check-in desks, handsome decorative arches, and marble walls and floors inset with mosaic tile designs. It was the prettiest little airport I had ever seen. Nader and I took pictures of each other as if we were tourists. But we were the only people wandering its ghostly interior. We awoke the next morning — Sunday, September 11 — to an explosion. Nader snapped awake, and we walked blinking into the sunlight. A crowd had gathered a few houses north of us. A white car emerged from the crowd. Three young men were in the back, but I could only see one clearly as the car sped past us. His face and arm were covered with blood. I nodded, though the whole scene seemed psychotic, as if bleeding kids were just one of the Gaza Strip’s quintessential experiences, like how Wisconsin has cheese. “What is the matter, ya Bamila?” he asked. I smiled wryly. Was that supposed to be comforting? Oddly enough it was in a giddy, dangerous way. There was a constant background sense of my life hanging by a slightly thinner thread than usual. Nader’s conviction that he could stop bullets was better than no reassurance at all. In the evening we sat on Nader’s roof watching the sun set over what we hoped would be the last day of Israel’s occupation of the Gaza Strip. Nader’s nephew Mohammad joined us on the roof. He was a handsome boy of about eleven with a haunted innocence in his eyes that seemed disconnected from his calm words and shy smile. I asked him what it was like when Israel invaded. Nader translated when I didn’t understand. “Of course. I peed myself five times.” He shrugged. “But after a while it’s normal. I mean, not normal…” He trailed off and looked away, unsure how to put it into words. He was disconcertingly unashamed and unemotional talking about such things. “You know, you look a little like Ronaldo,” I said in Arabic, trying to change the subject. “Ronaldo?” The way he tasted the word in his mouth, it was clear he had no idea who I was talking about. “Brazil?” He looked even more confused now. I had forgotten there was a refugee camp nearby called Brazil Camp. He had thought I was referring to someone from Gaza. “I don’t know, I’ve never been there,” I said, feeling depressed. “But I hear it’s beautiful.” He blinked and nodded, considering this. After the sun went down, we went back inside for dinner. Just as we were finishing, another deafening explosion rocked the air about three hundred yards away. We all instinctively ducked, but no one was willing to go outside and find out what had blown up this time. 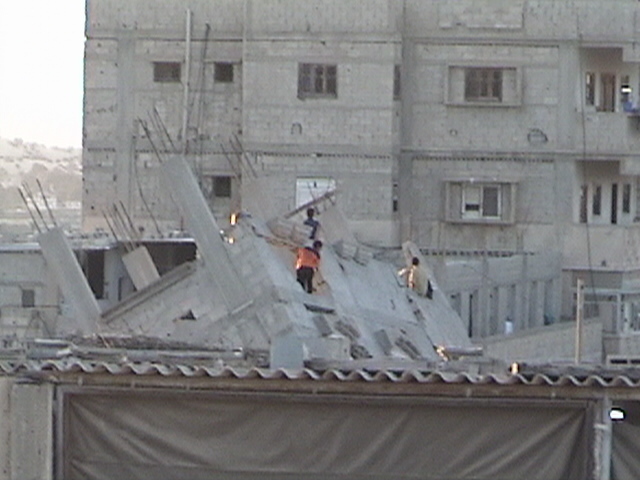 We later found out that it had been the Israelis demolishing one of their own sniper towers. Gaza’s neighborhoods had been watched and controlled by these towers for years, plagued by the horror of being surrounded by faceless soldiers who had the power to end your life with no repercussions and little oversight. Never again, we hoped, after tomorrow. 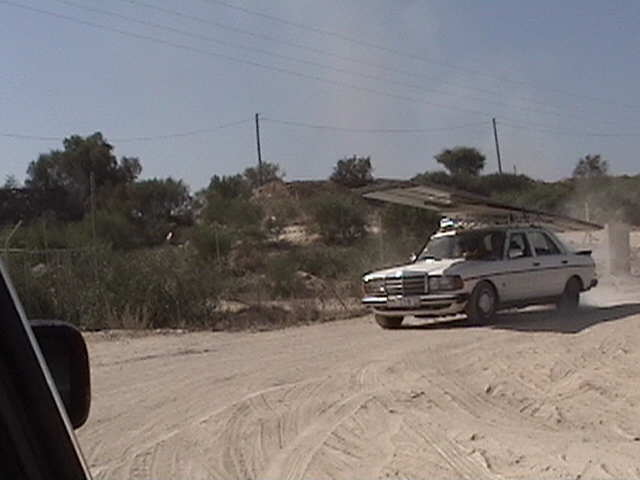 It was scorching hot the next morning when we stepped outside and looked hopefully toward the border with Egypt. The buffer zone between Nader’s house and the border had been a closed, forbidden, deadly military zone for as long as anyone could remember. Two Palestinian policemen walked gingerly into it and planted a small Palestinian flag on a mound of earth halfway between the last row of houses and the rusty metal border wall. Young boys, heedless of the danger, ran around gathering the millions of spent cartridge shells that blanketed the field to sell for scrap metal. A juice vendor set up shop for the spectacle. I bought an ice cold cup of carob juice, and its refreshing sweetness sang through my body. A few more people began cautiously walking toward the border, gaining momentum as they became more confident no one would shoot them. Soon a steady stream was walking toward the wall, and Nader and I joined the strange pilgrimage. I wore a headscarf to blend in. It was still obvious that I was a foreigner, but no one paid me any mind. 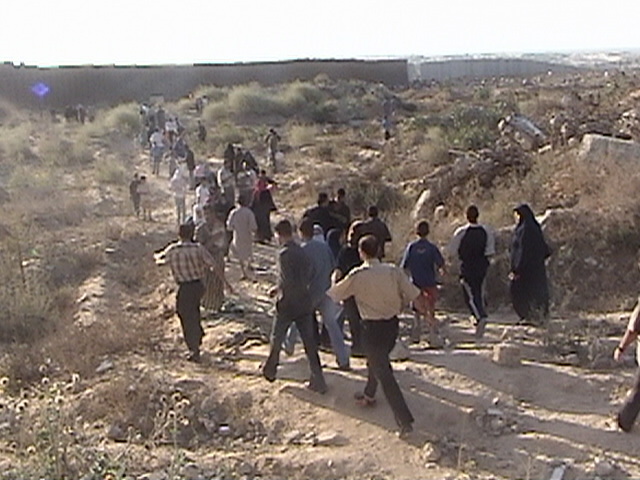 A section of the border wall had been pulled apart, and we walked through it into the no-man’s-land between the Palestinian and Egyptian border walls. The space between was as wide as a football field, a featureless stretch of land rutted with tank tracks. 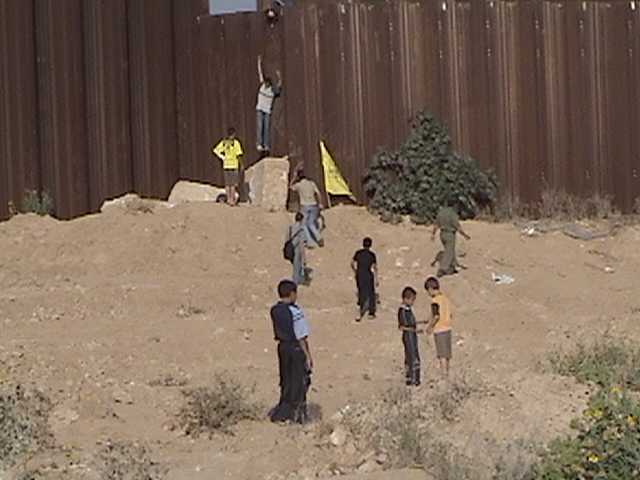 Men in black from both Fatah and Hamas scaled the walls to plant their flags. Several vans and pick-up trucks rolled by loaded down with masked militants sporting rocket-propelled grenades as a show of power. It was probably also an attempt by Hamas to claim credit for the Disengagement. 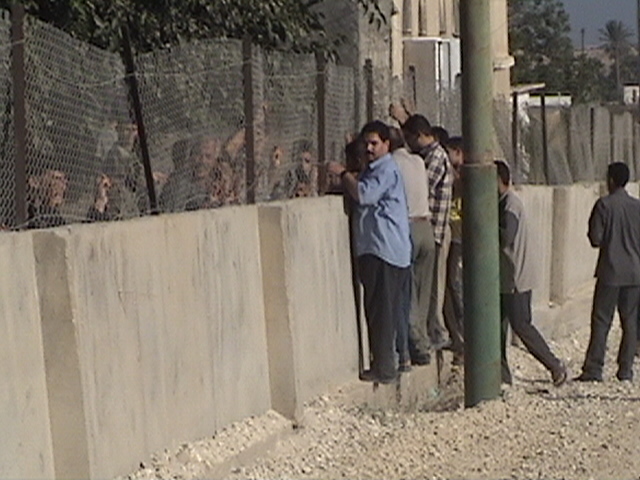 We walked down the barren thoroughfare until we saw a section of wall on the Egyptian side that was only five feet high and topped by a chain-link fence. Palestinians and Egyptians who hadn’t interacted in years were saying hello and clutching each other’s fingers. Many of the kids looked in astonishment at seeing Egyptian people for the first time. Everyone was cheerful and excited. It was a day of rare freedom. The next day they would tear down this wall and cross at will. Hundreds of stranded students, travelers, and medical patients streamed over the wall to get out or get back home. Egyptian customers went all the way to Gaza City to shop for apples and blankets while Gazans came back from Egypt with goats and sheep and cigarettes they had bought for a fraction of the usual cost. Shops on both sides sold out of their goods in a matter of hours, indicating how badly both economies had been distorted by this hermetic separation enforced by Israel and the widely despised Mubarak regime in Cairo. We continued walking until our view opened up to a white sand beach and an aquamarine sea fading to deep blue at the horizon. 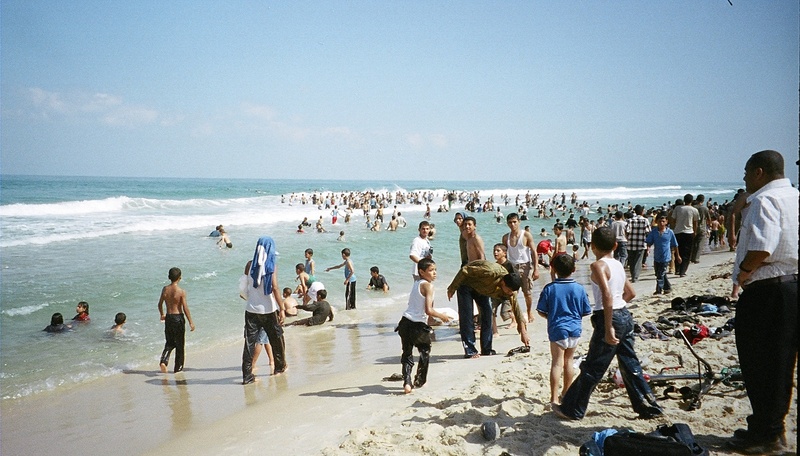 We joined hundreds of Palestinians, children bobbing in the shallows and young men splashing and laughing in the waves or seining for minnows. It was the first time many of them had ever seen the sea, and the younger ones were especially ecstatic. 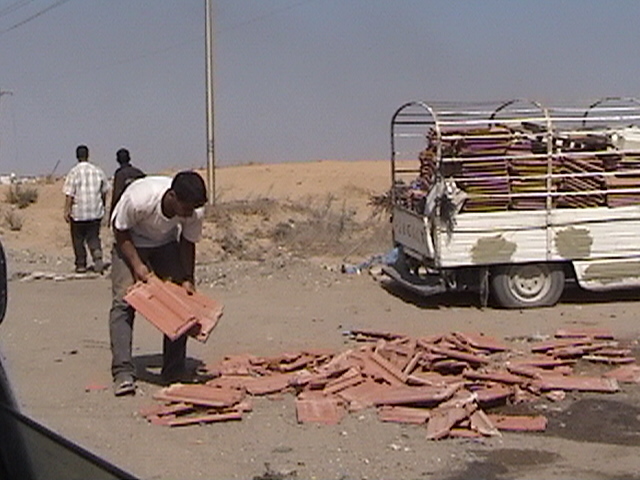 After taking in this scene for several happy minutes, we hired a cab to take us to one of the destroyed settlements. 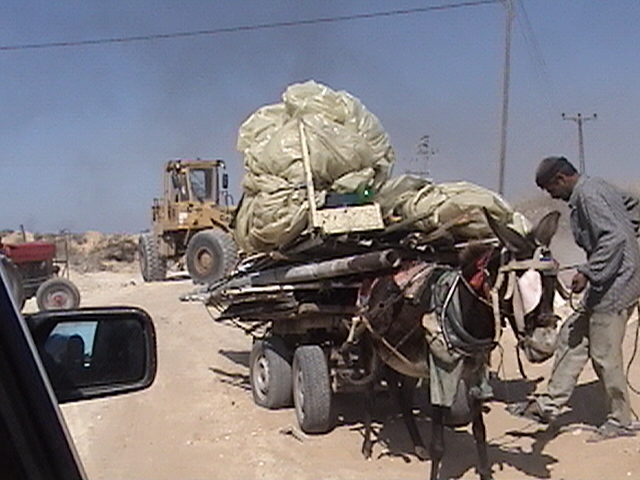 Caravans of trucks and donkey carts met us on the road carrying anything of even marginal value that had been left behind in the settlements, including roof tiles, sections of chain-link fence, pipes, wiring, rebar, doors, insulation, siding, and chains. Israeli garbage was apparently rich pickings. Some of the children on the donkey carts bore traces of deep poverty, the kind that stunts growth. They had probably come from the nearby refugee camps, where raw sewage runs down the middle of alleys and the brackish drinking water cause major health problems. Or from Mawasi, a formerly productive (and now deeply impoverished) strip of land near the beach that for many years had been locked away behind a ruinous checkpoint and a string of Israeli settlements. The settlements had until recently featured horse riding trails, a tourist hotel, and a golf course. 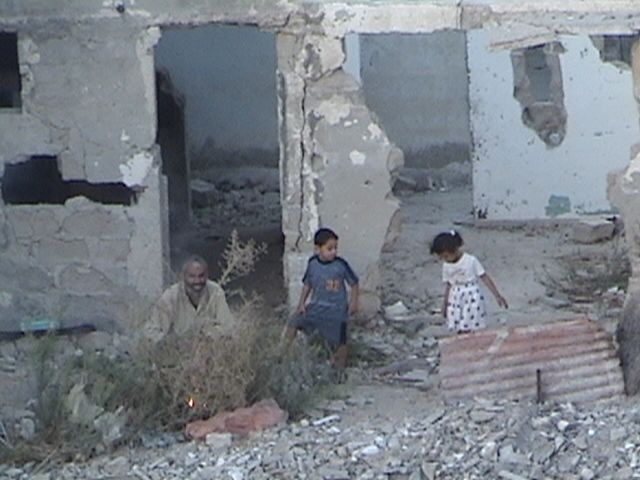 Now they looked like an upscale version of the pulverized neighborhoods of Rafah. 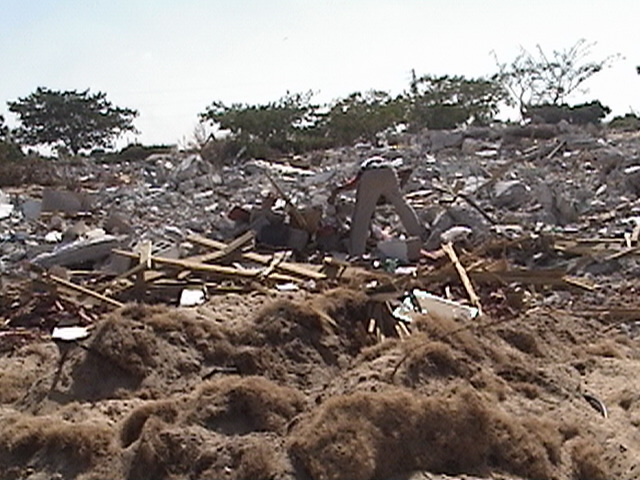 Bushes, trees, and flower beds surrounded rubble-strewn wastes. 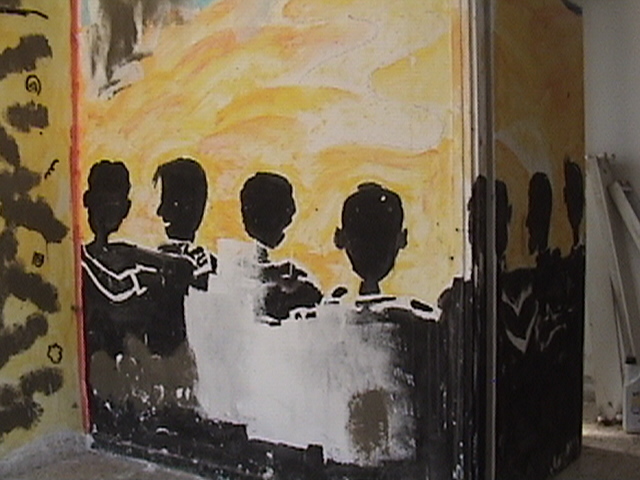 A half-destroyed school still had kids’ paintings tacked up on the crumbling walls. 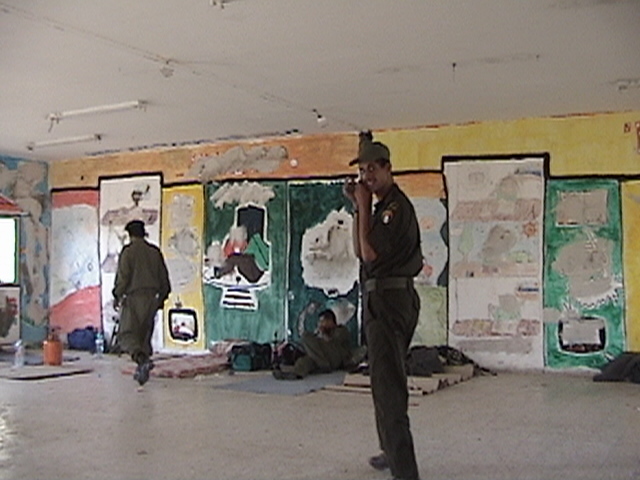 Palestinian policemen in blue camouflage uniforms watched as people had a curious look or hunted for anything of value. There wasn’t much they could do to prevent the looting. Turning arms against their own desperate people for stripping illegal buildings on their own land would have been bad for their fragile popularity. A feeling of hope and wonder hung in the air along with a faint, alarming stench of toxic burning. It was hard to believe the occupation might really be over, that people could roam their Gaza prison without fear of Israeli snipers, that they could finally repair their broken and bullet-scarred houses without fear that the next wave of violence would destroy everything again. 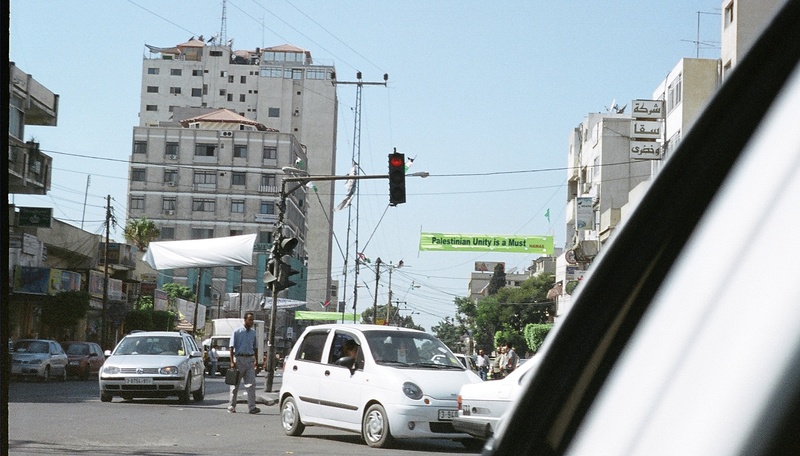 The next day, astoundingly, Nader and I were able to catch a taxi directly to Gaza City in broad daylight. The trip only took half an hour. The Abu Holi checkpoint had ceased to exist, as if that all-powerful obstruction had merely been a bad dream. I found a gift shop in downtown Gaza City and bought a commemorative mug with a picture of a dove and a Palestinian flag on it. The mug said, “Congratulations for the evacuation of Gaza… and hopefully for the West Bank…” It was a lukewarm victory cheer, but I supposed Palestinians were used to taking what they could get. 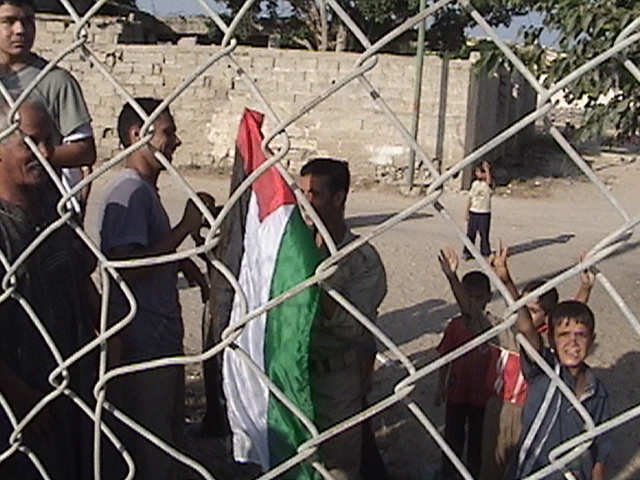 Triumphant Palestinian flags flew everywhere, and Nader and I soaked it all in, a feeling of pressure being released, of hamsters being given a slightly bigger cage with fewer daily cruelties and a hope, however slim, that things would continue to improve. It’s heartbreaking now to remember how we felt standing there, holding our breath and hoping. To understand what happened next in Gaza, the best summary I’ve seen is a brilliant article by Peter Beinart, a liberal Zionist writing in the Israeli newspaper Haaretz, called “What American Jews Haven’t Been Told about Gaza.” It demolishes a lot of talking points about Gaza that have come to be accepted truth in the US media, namely: Israel left the Gaza Strip in 2005, hoping it would lead to peace. Instead, Hamas seized power, ransacked greenhouses, threw its opponents off rooftops and began launching thousands of rockets at Israel. This narrative bears little resemblance to reality on the ground and its true dynamics. The truth is much more grim, and important for all Americans to know, since our tax dollars and government give Israel virtually 100% support for whatever it does. 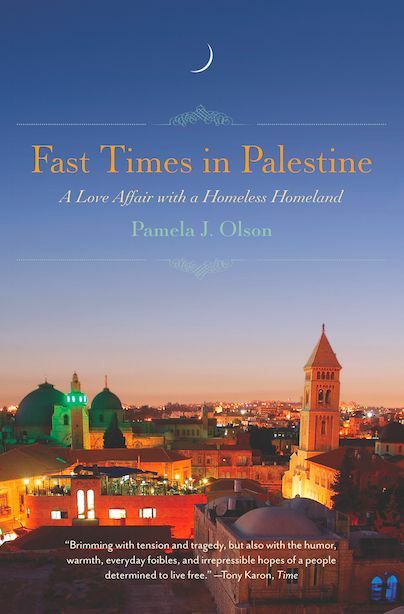 For more colorful, suspenseful, funny, tragic, and sometimes romantic stories (Palestine is kinda like that) about life under occupation, check out my book Fast Times in Palestine, published in March 2013. Then I noticed the guard’s lip twitch slightly, and I laughed with relief. He’d only been joking. Nader had probably put him up to it. I punched Nader’s arm lightly. The soldier smiled and handed me my passport back and motioned for me to pass toward the gate. Nader and I said our good-byes. Palestinians have a way of making guests feel like they’re the greatest people who ever lived, and that the community simply won’t survive if they leave. This was no exception. I exchanged untranslatable pleasantries with the guard who had joked with me, then another guard quickly checked my luggage. Two women took down my passport information, and after a final wave, I set out down the long, dark tunnel to Israel. Soon I reached the electronic gate in the center. It was shut tight. I looked around the empty hall and wondered what to do. I knew the soldiers could see me with their camera, but no one said anything. One answered in English, “Try to say something. He can see you. You just have to wait until he wants to open it.” I didn’t feel like playing this game, so I sat down on a concrete block to wait. 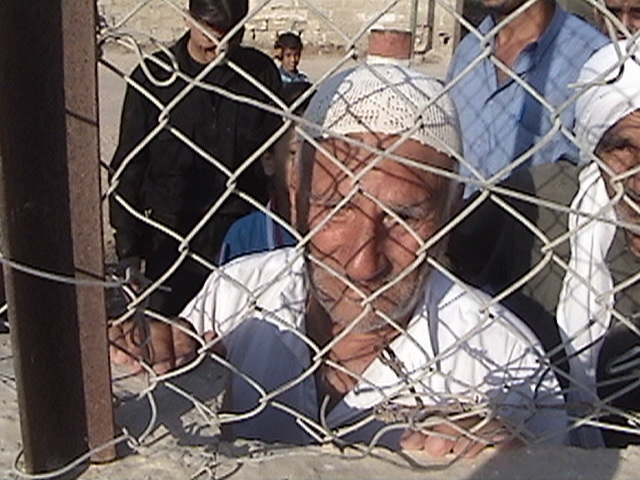 “What is the problem?” I started to retreat back to the Gaza side of the gate. What else could I do? I walked down the tunnel until I saw an electric turnstile labeled ‘4,’ which let me pass. The next section had metal fences that wrapped around like lines at Disneyland rides. People were hopping the gates since the lines were empty and there was no point doubling back. As soon as I’d jumped a gate, another voice said, “Stop. Go back!” I looked nowhere in particular in surprise. There wasn’t anything to focus on or look at like it was stupid. I was talking to thin air. I started walking back toward the electric turnstile, bewildered and amused and uneasy. “Stop!” the voice said again. I stopped. “Put your bag down.” I put my bag down. Then he said something garbled that made no sense. What does that mean? Oh, maybe he wants me to put my purse down, too. I did. The voice relaxed again. “Turn around.” I blinked. Then I turned my back to… where my front had been before. I felt helpless and exposed. Were they hitting me with X-rays or just jerking me around? Would they ask me to pull my shirt up in public? “Turn around again.” I turned back around, rolling my eyes with my whole body. “Yes,” I said, though I was tempted to say, No, I just teleported in from Nepal. Where the hell do you think I just came back from? “Really?” He hesitated a moment, as if he wanted to ask further questions. As if he was genuinely curious about the place I had just come from, a place that in Israeli discourse was synonymous with hell — not a place any sane, normal person would ever live or visit. But he couldn’t seem to formulate any coherent questions, and I knew it would be months or years before I could formulate any coherent answers. “Yes,” I said again with finality, and grabbed my bags and left. Though about 8,000 settlers were pulled out of Gaza and a few small West Bank outposts in 2005, the settler population in the West Bank increased by more than 12,000 that year. And it has continued growing ever since. The Disengagement was also unilateral, which meant there was no coordination with the Palestinians. No core Palestinian requests were met, such as allowing free commerce, free sea access, and the reopening of the Gaza International Airport. Palestinians were effectively blockaded even before Hamas won elections in 2006 with a 45% plurality of the vote. What followed was, among other things, an increasingly brutal siege that turned Gaza into the world’s largest open-air prison (collective punishment is a war crime) and three massive bombing campaigns in 2008-9, 2012, and 2014 — attempts to force Palestinians to accept their subjugated and imprisoned status indefinitely without protest or resistance. It is not clear what will happen next. Again I must thank you for your painstaking efforts and sacrifice to right what is wrong for people who deserve no less than freedom,human rights and dignity every day of their lives. I was finally able to get your book and read it. Well worth the wait! I am in the process of rereading and combing through your marvellous website,taking up as much as I can from your lectures,reports,links etc. I am apalled with my Canadian Government’s turn of a blind eye to the oppressive cruelties of Occupation and their seemingly unconditional support of anything Israel wishes to do. I thought it was the Conservative policy mindset that has altered Canada’s course from respected Peacekeepers to so much,much less. Alas my e mails and calls confirm all of our major Parties seem to think alike with their uwavering support of Netanyahu. Only the masses can force the policy change necessary but reaching those masses with the truth and then the will to make that effort is not a simple solve. Hopefully,there will come an answer. Thanks for the updates. Thanks so much, Karol, for everything you do. We can make a difference — we just have to keep working! Nothing lasts forever… but power and money don’t go down without a struggle. Keep it up and know you are not alone. Hello Pamela, I just finished reading your “Fast Times” book last night, at the recommendation of my husband. LOVED IT! I’ve traveled to Palestine/Israel a number of times, and will probably continue to do so into the future. Your book captures so much so well. I’m a Presbyterian pastor, and have served on the board of a very small group that brings Fair Trade Palestinian crafts to North American markets. Also, my studies in biblical literature have led me on many different journeys, and I am currently the volunteer Artifact Registrar for an archaeological project above the NW shore of the Galilee – so that brings me “back home” every June. Being in the archaeological community can open many back doors in the area, as well as church-related contacts. I am fascinated with your photos from Gaza. 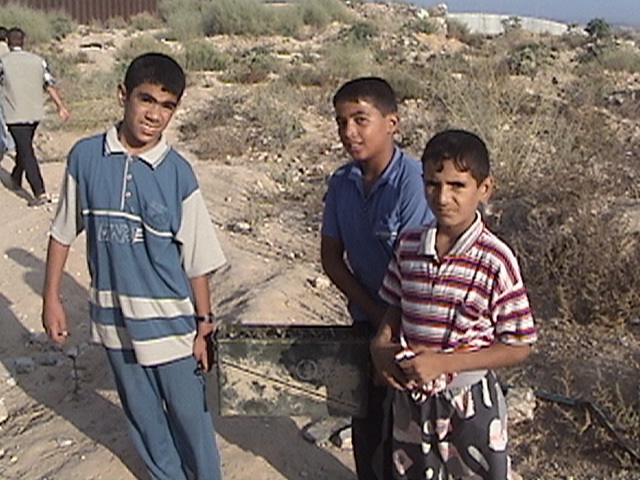 Three friends and I had applied to enter Gaza in 2009, and take some supplies/gifts to a school that we supported (Atfaluna School for the Deaf), but SIX TIMES our paperwork was “lost,” so we were not allowed to enter. I’ve never been to Gaza, and have only heard stories about it from the now retired director of the school. She has some heart-wrenching stories about the times around and after the time of Disengagement. I would love to visit with you any time that might be possible, either in North America or the Middle East. My husband and I live in Washington State, about half an hour from the Canadian border (between Seattle and Vancouver), so if you are ever in our neighborhood and have some spare time, let us know! Or if you are ever in the Galilee around or during June of any of the next several years, let us know! So many of the places you have mentioned hold a special place in our hearts – even Dahab and Neweibeh! 🙂 Also Taybeh, Sebastiya (near Nablus), Mughar, and the “pre-1948 village” that crowned our current archaeological site of Yakuk, and so many more! We have a Facebook page that you may enjoy, titled, “Mohr of Huqoq,” which chronicles some of our adventures. Thank you, Pamela, for your insightful book, which is obviously a labor of love for a beautiful people in an unparalleled land. Blessings on all your work!